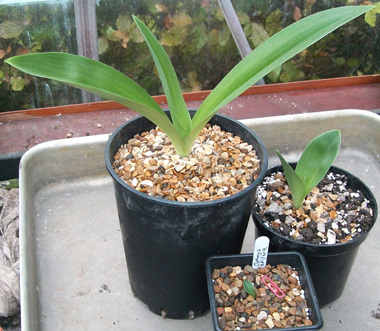 Large containers such as patio pots, tubs, or troughs can be a great place to plant and display hardy orchids. Their condition and location can be easily monitored and they will not be crowded out by other plants. They can be moved around for a sunny and prominent location during flowering and a more sheltered, drier spot in winter. See Cultivation for notes on composts to use. Don't forget, though, to have adequate drainage holes. Containers can otherwise become waterlogged very easily after heavy rain, a reliable method of orchicide. Conversely some orchids will die in summer if the pot dries out while you are away on holiday. Also, because above ground there is no thermal insulation from the earth, even a large trough could freeze right through in a hard winter such as 2010, killing the otherwise hardy root system. A rather different planting tip I have found very useful is to plunge a container into the ground. The great advantage here is that you instantly create an ideal micro-habitat for the orchids in ANY garden, using very cheap materials. It is easy to make, lasts for several years, and the plants need virtually no attention as the system is self-watering. You can buy an ordinary builder's plastic bucket for about £1. Drill 8 - 10 drainage holes each about 5cm up from the bottom. They should be at least 1cm in diameter to avoid getting clogged up. Fill to just beyond the holes with grit or a suitable inorganic material. Then fill up the bucket with your customised orchid compost mix. Plant the orchids with the buds about 4cm below the surface then dress with a further layer of grit on top. Sink the bucket into the ground in a suitable location. The plants benefit from a free-draining compost which will never completely dry out. After rain a water reservoir is retained at the bottom, but the drainage holes prevent waterlogging. The grit in the reservoir prevents the water from becoming too putrid. Re-potting is not necessary until after 2 or 3 years. The height at which the bucket protrudes out of the ground can be adjusted - set flush with the soil to hide unsightly edges with a mulch, or raised up a few inches if the plants need extra drainage relative to local soil conditions. The principle of this planter, which creates bog-like conditions, can be adapted in many ways, of course, and you don't have to use a bucket! 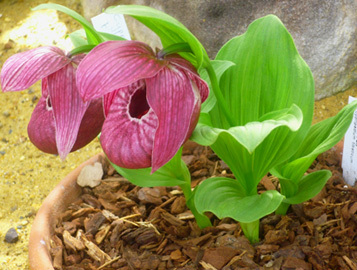 The photo is of a Cypripedium at RHS Wisley. It is planted in a clay pot which is plunged in a bed of sand up to the rim. The sand plunge is in a temperature-controlled Alpine house. All-in-all this is probably the height of luxury for a cultivated orchid. Clay pots are permeable, so the sand plunge can be watered rather than the pot, avoiding extremes of wetness or dryness. This approach undoubtedly can produce excellent results, but don't despair if you can't aspire to these facilties - hardly any of us can, after all! Free standing plastic pots, intelligently watered, can work perfectly well, as can a simple cool greenhouse, provided you protect it from extremes of temperature.